Since the ICTY’s closure on 31 December 2017, the Mechanism maintains this website as part of its mission to preserve and promote the legacy of the UN International Criminal Tribunals. The selected documents provided herein are for information only and are not to be considered as ICTY official records. Contempt cases can be found on a separate page. Research into further materials can be conducted using the ICTY Court Records. Appeal under jurisdiction of the Mechanism for International Criminal Tribunals. Trial Chamber Judgement: sentenced to 40 years' imprisonment on 24 March 2016. 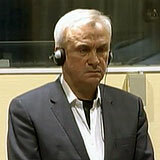 Ratko Mladić was sentenced to life imprisonment on 22 November 2017. Trial Chamber Judgement: acquitted on 31 March 2016. MICT Prosecution's Notice of Appeal against the Trial Judgement filed on 2 May 2016. Retrial under jurisdiction of the Mechanism for International Criminal Tribunals. Appeals Chamber ordered a retrial of Stanišić and Simatović under all counts of the indictment on 15 Dec. 2015. Both accused had been acquitted by the Trial Chamber on 30 May 2013. No trials at this stage. Stanišić & Župljanin (IT-08-91) "Bosnia and Herzegovina"
Both accused were sentenced to 22 years' imprisonment on 30 June 2016. Ademi & Norac (IT-04-78) "Medak Pocket"
Cases joined to this trial: Ademi (IT-01-46) , Norac (IT-04-76) "Medak Pocket"
Mejakić et al. (IT-02-65) "Omarska and Keraterm Camps"
Indictment against Zdravko Govedarica, Gruban (first name unknown), Predrag Kostić, Nedjeljko Paspalj, Milan Pavlić, Milutin Popović, Draženko Predojević, Željko Savić, Mirko Babić, Nikica Janjić (see also Sikirica et al.) and Dragomir Šaponja (see also Sikirica et al.) withdrawn on 8 May 1998. Indictment against Nenad Banović withdrawn on 10 April 2002. Stanković & Janković (IT-96-23/2) "Foča"
Todović & Rašević (IT-97-25/1) "Foča"